It's a dream come true for some people: your folks fall so hopelessly in love with your fiance that they don't ever shut up about it. George Clooney's parents are so ecstatic about their son's engagement that they've taken to publicly announcing how thrilled they are. First his mom released a statement, now Clooney's dad has confirmed the news. Perhaps this all just their way of putting silent pressure on Clooney to give them the grandkids he said he'd never have, for the love of Babies 'R' Us. Or they just really, really love getting quoted on websites. 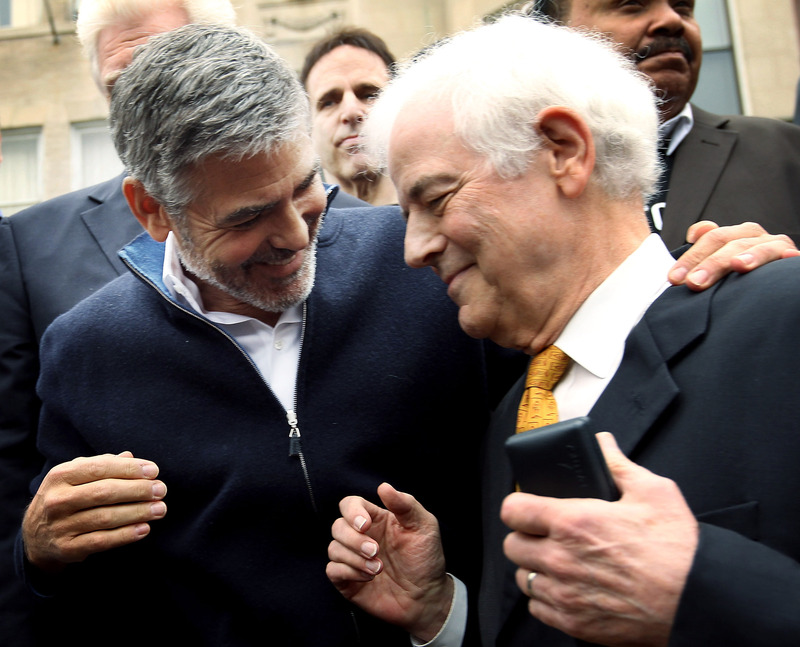 Clooney crushed many women's dreams of one day being swept off their feet by the perennially not-married silver fox when he allegedly got engaged to the British lawyer, Amal Alamuddin last week. But who was the one to confirm the alleged plans of knot-tying? His mother, naturally. Nina Clooney confirmed the engagement and said that she was just thrilled. She bragged to the press about her son, which, for a 52-year-old man, is a little eye-roll inducing, but still kind of sweet. It's like the macrocosm of Facebook bragging. We are thrilled [...] We have had an opportunity to interact with this wonderful young woman and these are two great people. Yes, we get it, Mr. and Mrs. Clooney — you're proud of your boy. Alamuddin is a wonderful lady. Your favorite adjective is "thrilled." But your son is a grown man who doesn't need you running around expressing your exhilaration; it seems a bit excessive, doesn't it? Shouldn't Clooney himself be the one to release a statement? Let the man be happy with his fiance! This private actor wants to keep things low key, after all. But you've got to wonder: what have his parents' Facebook posts looked like for the past few days?